For more than 15 years, EKYFLEX has been the gold standard for professionals seeking to optimise horses joint function where a long stride, solid bearing or precise movements are required throughout their career. Intensive joint strain creates specific nutritional requirements in horses. With joint disorders being the primary cause of horses being retired it is ,therefore, essential to provide horses with the nutrients their cartilage needs throughout their lifetime. This concentrated and comprehensive formula contains innovative ingredients: low-molecular-weight collagen hydrolysate, which encourages absorption by the body, superior quality glucosamine, chondroitin, MSM and a plant extract turmeric. Raw materials: Lithothamnion, glucosamine (sulphate 2KCL), marine collagen hydrolysate, methylsulfonylmethane (MSM), alfalfa, turmeric (Curcuma longa), soya protein concentrate, carob, oyster shells, sugar beet molasses, marine chondroitin sulphate, black pepper (Piper nigrum) . Analytical constituents: Humidity < 10%, raw proteins 23%, raw cellulose 2.4%, raw fats 22%, raw ash 23.6%, sodium 0.2%. Nutritional support formulated for horses intensive joint needs. - Athletic: 1 measure per day for 2 months 3 times per year. - Intensive requirements: 1 to 2 measures per day for 4 to 6 months. - Senior horses: 1 measure per day. 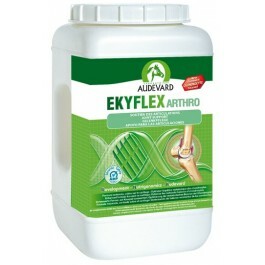 Ekyflex Tendon is a complementary feed formulated by AUDEVARD Laboratories, designed to provide nutritional support for sport horse's tendons and ligaments.